Protesters calling for an end to racial profiling by police officers in Missouri and elsewhere in the United States who are marching from Ferguson, Missouri, where unarmed teenager Michael Brown was shot and killed by then-Ferguson police officer Darren Wilson, have been the target of racist attacks. However, this time, those racist attacks are coming from a Democrat. 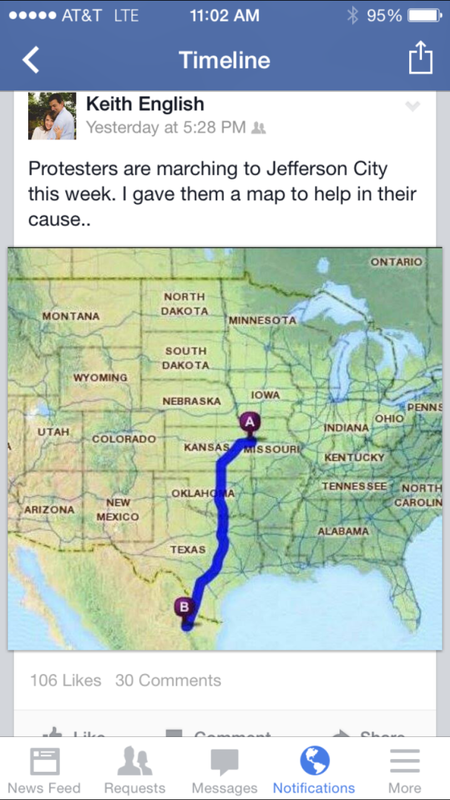 Keith English, a Democratic member of the Missouri House of Representatives from Florissant (located near Ferguson in northern St. Louis County), posted a map to his Facebook page showing a line from somewhere in or near Kansas City, Missouri to somewhere in or near Monterrey, Mexico, located in the Mexican state of Nuevo León. In his Facebook post (which has since been deleted, although a screengrab of the Facebook post was posted on the St. Louis Post-Dispatch website), English remarked that he was giving the map to the protesters to “help in their cause”. I’m certain that the protesters have zero use for English’s map and view his map and Facebook post as racist. For Keith English to publicly state that he thinks that people who want to eliminate racial profiling by police officers in Missouri and elsewhere in this country, including many of his own constituents, should be shipped to a foreign country is extremely offensive. Racism should not be tolerated in the Democratic Party, and English should be expelled from the Democratic caucus of the Missouri House of Representatives. Should English run for another term in office in 2016 as a Democrat, progressives should run a Democratic primary challenger against him.